Lymphadenitis is the inflammation of lymph nodes. It is often a complication of bacterial infections, although it can also be caused by viruses or other disease agents. Lymphadenitis may be either generalized, involving a number of lymph nodes, or limited to a few nodes in the area of a localized infection. Lymphadenitis is sometimes accompanied by lymphangitis, which is the inflammation of the lymphatic vessels that connect the lymph nodes. The lymphatic system is a network of vessels (channels), nodes (glands), and organs. It is part of the immune system, which protects against and fights infections, inflammation, and cancers. The lymphatic system also participates in the transport of fluids, fats, proteins, and other substances throughout the body. The lymph nodes are small structures that filter the lymph fluid and contain many white blood cells to fight infections. Lymphadenitis is marked by swollen lymph nodes that develop when the glands are overwhelmed by bacteria, virus, fungi, or other organisms. The nodes may be tender and hard or soft and "rubbery" if an abscess has formed. The skin over an inflamed node may be red and hot. The location of the affected nodes is usually associated with the site of an underlying infection, inflammation, or tumor. In most cases, the infectious organisms are Streptococci or Staphylococci . If the lymphatic vessels are also infected, in a condition referred to as lymphangitis, there will be red streaks extending from the wound in the direction of the lymph nodes, throbbing pain , and high fever and/or chills. The child will generally feel ill, with loss of appetite, headache , and muscle aches. Lymphadenitis is also referred to as lymph node infection, lymph gland infection, or localized lymphadenopathy. Streptococcal and staphylococcal bacteria are the most common causes of lymphadenitis, although viruses, protozoa, rickettsiae, fungi, and the tuberculosis bacillus can also infect the lymph nodes. Diseases or disorders that involve lymph nodes in specific areas of the body include rabbit fever (tularemia), cat-scratch disease , lymphogranuloma venereum, chancroid, genital herpes, infected acne , dental abscesses, and bubonic plague. Lymphadenitis can also occur in conjunction with cellulitis, which is a deep, widespread tissue infection that develops from a cut or sore. In children, tonsillitis or bacterial sore throats are the most common causes of lymphadenitis in the neck area. Diseases that involve lymph nodes throughout the body include mononucleosis, cytomegalovirus infection , toxoplasmosis , and brucellosis. The early symptoms of lymphadenitis are swelling of the nodes caused by a build-up of tissue fluid and an increased number of white blood cells resulting from the body's response to the infection. Further developments include fever with chills, loss of appetite, heavy perspiration, a rapid pulse, and general weakness. Swollen lymph node glands in a young girl's neck. 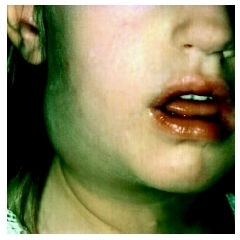 mumps , HIV, tumors in the neck region, and congenital cysts that resemble swollen lymph nodes. Although lymphadenitis is usually diagnosed in lymph nodes in the neck, arms, or legs, it can also occur in lymph nodes in the chest or abdomen. If the child has acutely swollen lymph nodes in the groin, the doctor will need to rule out a hernia in the groin that has failed to reduce (incarcerated inguinal hernia). Hernias occur in 1 percent of the general population; 85 percent of children with hernias are male. The most significant tests are a white blood cell count (WBC) and a blood culture to identify the organism. A high proportion of immature white blood cells indicates a bacterial infection. Blood cultures may be positive, most often for a species of staphylococcus or streptococcus. In some cases, the doctor may order a biopsy of the lymph node to look for unusual infection or lymphoma. If a child develops symptoms of lymphadenitis, he or she should be taken to the doctor or emergency room. The medications given for lymphadenitis vary according to the bacterium or virus that causes it. For bacterial infections, the child will be treated with antibiotics , usually a penicillin, clindamycin, a cephalosporin, or erythromycin. Supportive care of lymphadenitis includes resting the affected area and applying hot moist compresses to reduce inflammation and pain. Cellulitis associated with lymphadenitis should not be treated surgically because of the risk of spreading the infection. Pus is drained only if there is an abscess and usually after the child has begun antibiotic treatment. In some cases, biopsy of an inflamed lymph node is necessary if no diagnosis has been made and no response to treatment has occurred. Inflammation of lymph nodes due to other diseases requires treatment of the underlying causes. The prognosis for recovery is good if the child is treated promptly with antibiotics. In most cases, the infection can be brought under control in three or four days. However, in some cases it may take weeks or months for swelling to disappear; the length of recovery depends on the underlying cause of the infection. Children with untreated lymphadenitis may develop abscesses, cellulitis, or blood poisoning (septicemia), which is sometimes fatal. Prevention of lymphadenitis depends on prompt treatment of bacterial and viral infections. Parents may be concerned that enlarged lymph nodes in their child are malignant. They should seek immediate medical attention for the child so concerns can be addressed in a timely manner. Hernia —A rupture in the wall of a body cavity, through which an organ may protrude. Lymphangitis —Inflammation of the lymphatic vessels. It often occurs together with lymphadenitis (inflammation of the lymph nodes). Septicemia —A systemic infection due to the presence of bacteria and their toxins in the bloodstream. Septicemia is sometimes called blood poisoning. Streptococcus —Plural, streptococci . Any of several species of spherical bacteria that form pairs or chains. They cause a wide variety of infections including scarlet fever, tonsillitis, and pneumonia. Mandal, B., et al. Lecture Notes on Infectious Disease. Oxford, UK: Blackwell Publishing, 2004. Lymphadenitis. Available online at: http://www.emedicine.com/ped/topic32/htm. Judith Sims Rebecca J. Frey, Ph.D. Thank you so much for writing such an easy to understand article on this subject. I took my daughter to the ER today because her toe was hurting and very red. On the way to the ER she also complained that her armpit was hurting again (she had mentioned that earlier in the week and I thought she had a sore muscle) so I told her we would have the Dr check it out. He told me she had a soft tissue infection on her toe and showed me a faint red stripe and then left to get her antibiotics. The nurse came back with a paper stating that she had cellulitis and lymphadenitis. I was surprised because he didn't tell me anything and new nothing about how it is caused or what it was. When I searched for info on the net cancer popped up too many times until I came across your article. I feel better informed now and I thank you. I am still concerned about it traveling from her toe to her armpit and why she felt it in her armpit before her toe. I have a follow up appt. in 2 days, so I'm sure her Dr can explain. She just started to complain about her toe this morning and already it had a red streak. She doesn't even have any scratches but her toe had really dry skin. Thank you, thank you so much for this. My 8-year-old daughter went to the doctor today with what appears to be this very thing. She's being treated with high dose of Augmentin twice daily, but the swelling on her neck appears to be somewhat more pronounced than it was this afternoon. We're keeping an eye on her of course, but this article really made me feel better. I was also scared to death about the "c-word."